Turkey is a country rich with history and a magical tapestry of cultural, architectural, and culinary elements. As it rapidly modernizes, it’s becoming one of the hottest destinations for travelers seeking to discover a unique vacation destination. Because of the affordability of traveling to Turkey, many people are flocking in to visit this lovely country that rests comfortably between the Middle East and Europe, effectively providing a flair from each that is unmatched. In Turkey, you’ll find a wondrous array of foods that you’ve likely never tried too. Knowing what to taste can help you navigate the offerings. Here are 20 of the best dishes to try on your visit to Turkey. Without a doubt, one of the first things you should sink your teeth into upon arriving in Turkey is kebap. It comes in many forms as the word kebap translates to “charcoal-grilled.” That includes roasted chestnuts that you’ll find during the winter months. You’ll find the street vendors selling them in paper bags. For meat, you’ll find an assortment of things to try. There’s spicy adana, and for those who want a milder flavor, urfa is right up your alley. For a different take on a sandwich, try the antep, which is meat wedged between thick slices of eggplant. However, the most famous kebap to try is Iskender kebap. It was created by a man named Iskender Efendi back in 1867 and is a heavenly combination of thin-sliced lamb covered in yogurt, butter, and tomato sauce. If you love pizza, pide is something you’ll want to try. It’s affectionately known as Turkish pizza. It consists of wood-fire-oven-baked flatbread. And much like the pizza you know and love, pide can come with a variety of toppings. 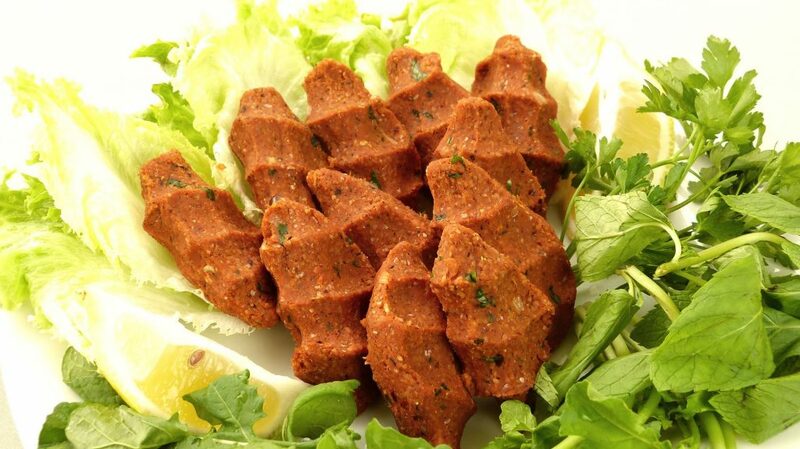 Turkish sausage, sucuk, is a nice choice. Pastrami is also popular. Minced or chopped lamb meat is another famous topping. And yes, it also comes with cheese and vegetables. 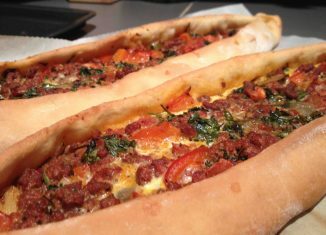 You’ll find restaurants devoted to pide, however don’t be surprised when they top it with an egg in the center as they pull it from the oven. A close relative of pide is lahmacun which is a more simplistic but no less delicious version. 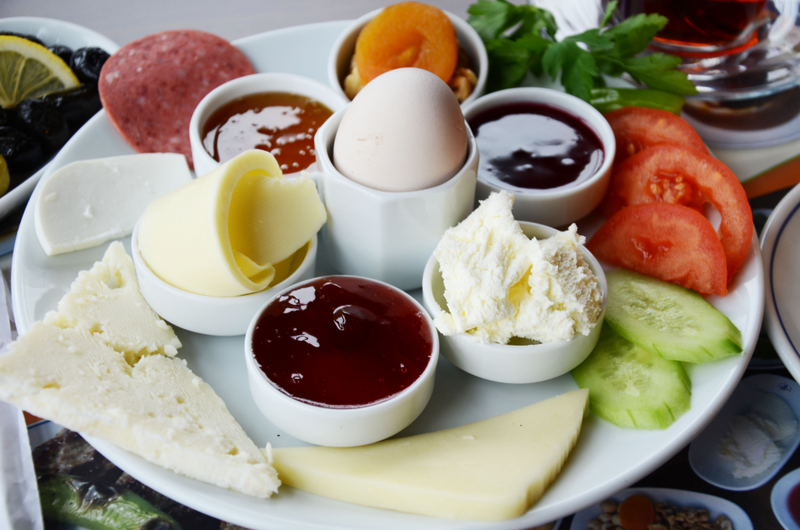 Start your morning off right with a proper Turkish breakfast. 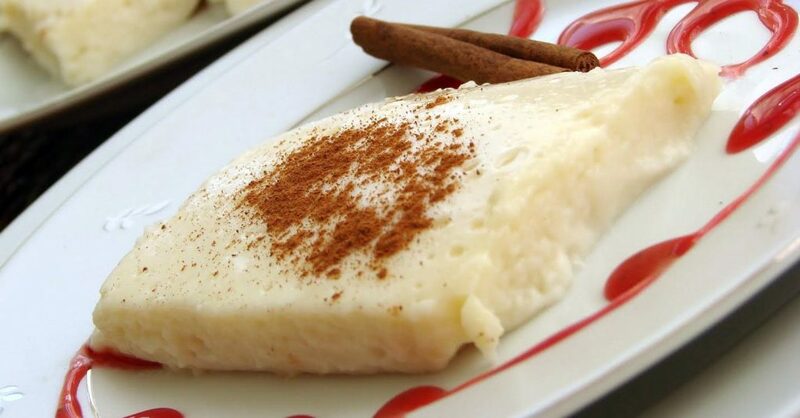 It’s made with fresh-baked bread, honey, and kaymak, a Turkish clotted cream. You’ll also find it with preserves (typically fig or rose marmalade), cheeses made from sheep’s milk, and cucumbers and tomatoes. It’s served in so many ways by region, each one of them delicious in their own way. Simit is a great snack for when you’re busy sightseeing or shopping. It dates back to the 16th century. 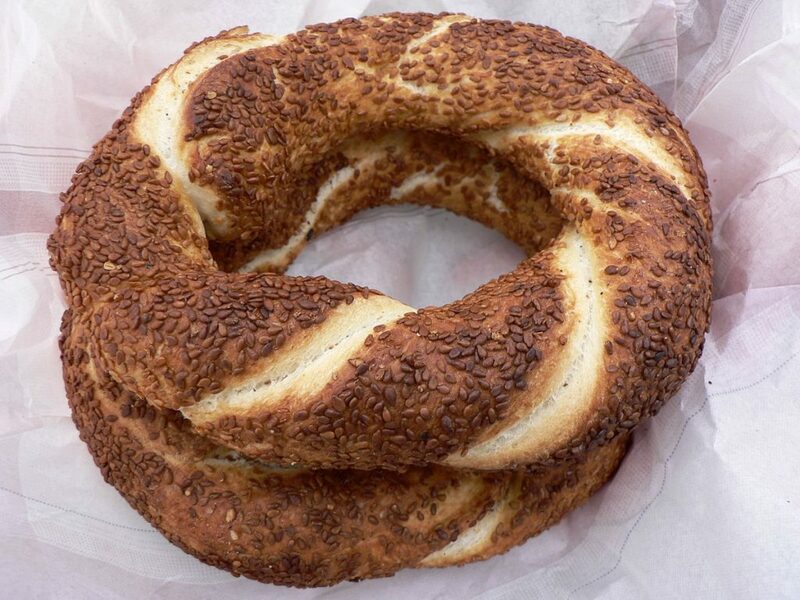 These bread rings are still very much a prized snack offering in Turkey. Encrusted in sesame seeds, it makes for a great breakfast item or to grab from one of the many vendors while on the go. 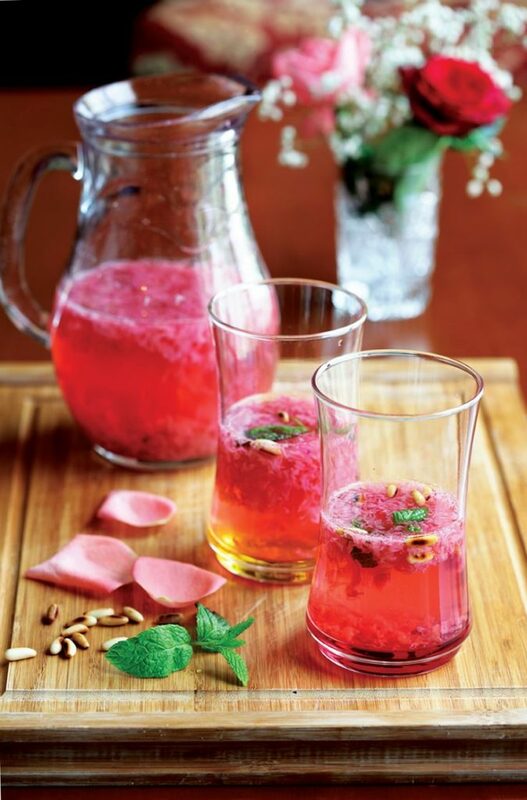 You’ll come to find that many Turkish offerings are delightfully tinged with rosewater. Interestingly enough, Turkey is the capital of Damascus roses. No one produces more of them. The oil from these roses is essential in some of the finest perfumes in the world. The Turks use the petals to create everything from marmalades to olive oil to desserts. This delightfully exotic flavor will greet you in many of the things you taste here. 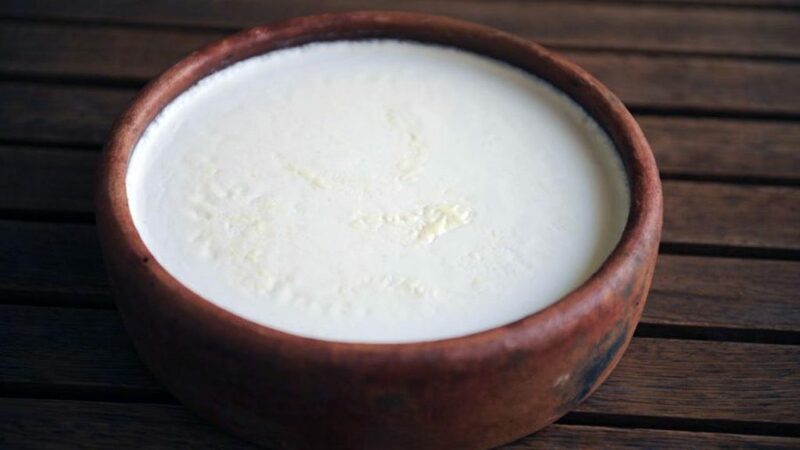 Yogurt is a huge part of Turkish cuisine. You’ll find it served alongside many of the things you eat in Turkey. In fact, the Turks eat more yogurt than any other country. They enjoy it plain or use it to create soups. You’ll also find it in cacık, a delicious salad. Try it in drink-form with one of Turkey’s most beloved beverages, the salty ayran. Every country has their own version of dumplings and Turkey is no exception. 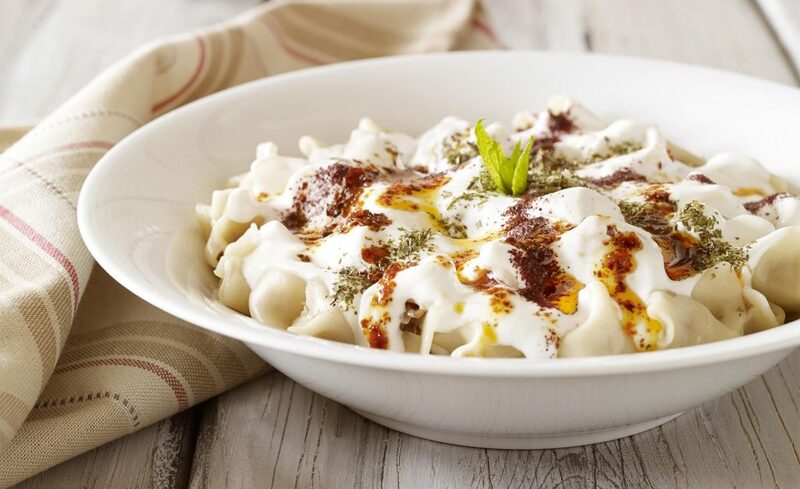 In Turkey, they are called mantı and they are topped with tart yogurt, melted butter, and an assortment of chopped herbs including chili flakes. It’s familiar enough to adore yet exotic enough to stand out. You’ll love them! 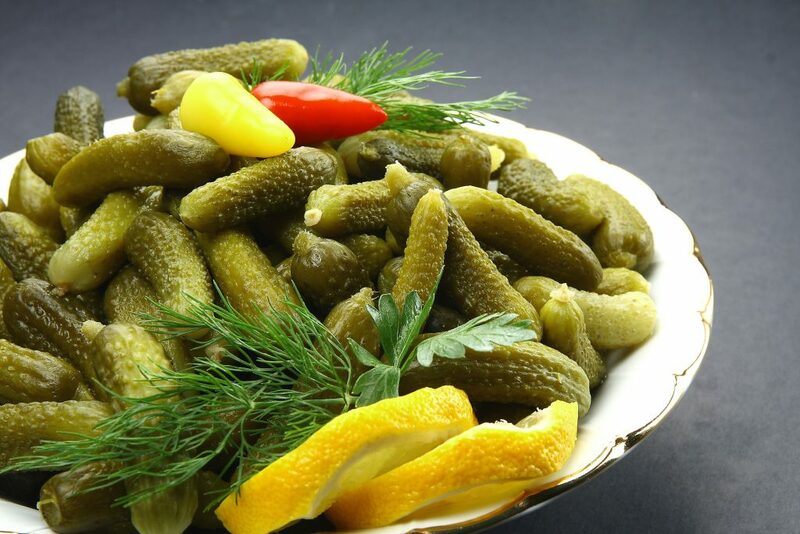 Pickling is very popular in Turkey. You’ll find gorgeous shops where displays of pickled vegetables including cabbage, tomatoes, eggplant, and cabbage, to name a few, are vibrantly displayed. These vegetables are submerged into a tart vinegar and the results are exceedingly delicious. Try this bean-filled dish filled with blond beans. They get stewed in a fragrant tomato gravy. While simple, it’s hearty and fulfilling. You’ll be craving it forevermore after your trip. 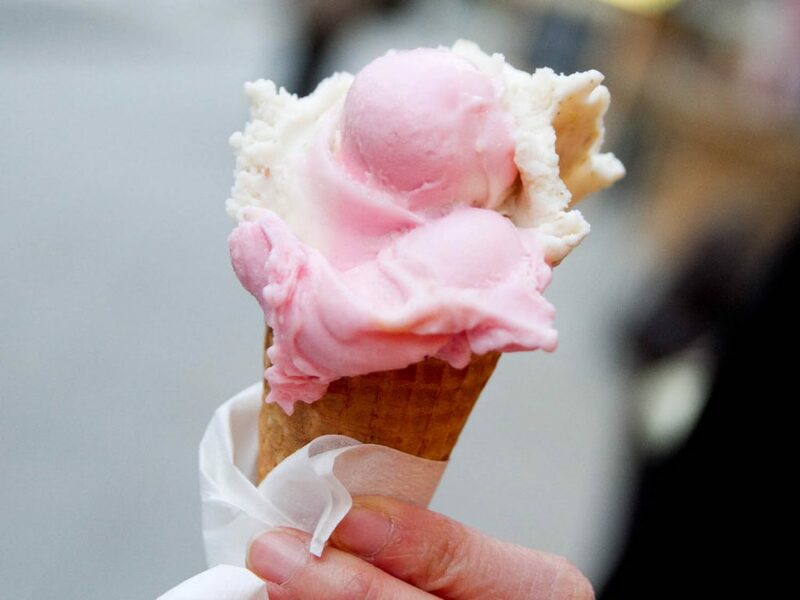 Every country has ice cream, but no country has it like Turkey. It’s different in the most unique of ways. It has a chewy texture thanks to being made with salep which comes from the roots of orchids. The flavor is a bit smoky and mystic too. If you love ice cream, seek it out from the vendors. You can’t miss them. Plus, they give an incredible performance that you’ve just got to see. 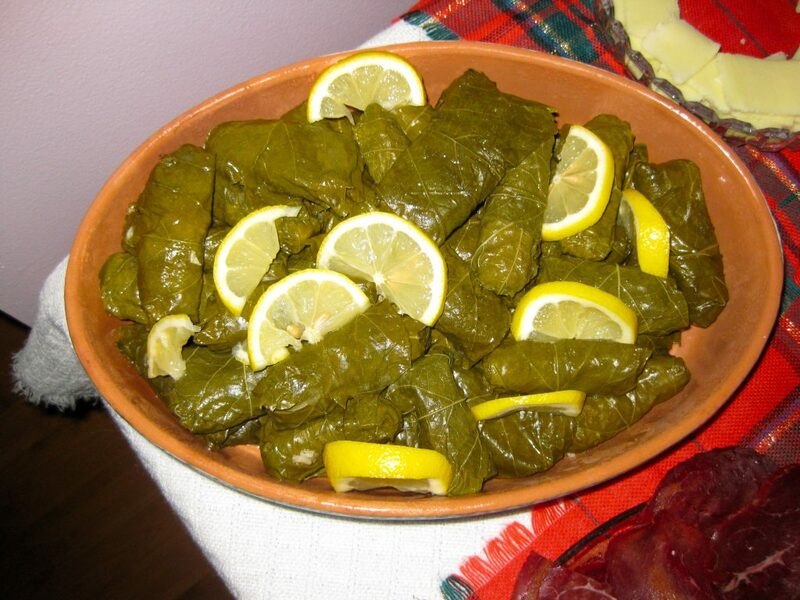 Sarma features rice and meat tucked into the leaves of vines or cabbages. Similarly, dolma is rice and meat stuffed into vegetables like tomatoes, peppers, dried eggplant or zucchini. Which will be your favorite? You’ll have to try each variety to see. But you should have ample time to do so because they adorn the table for just about every reason you can think of. This is going to sound weird. Really weird. But hear us out. True that saying “chicken breast pudding” isn’t going to help, but while it sounds totally bizarre to combine boiled chicken with milk and sugar and then dust it with cinnamon, it’s a surprisingly beautiful combination. 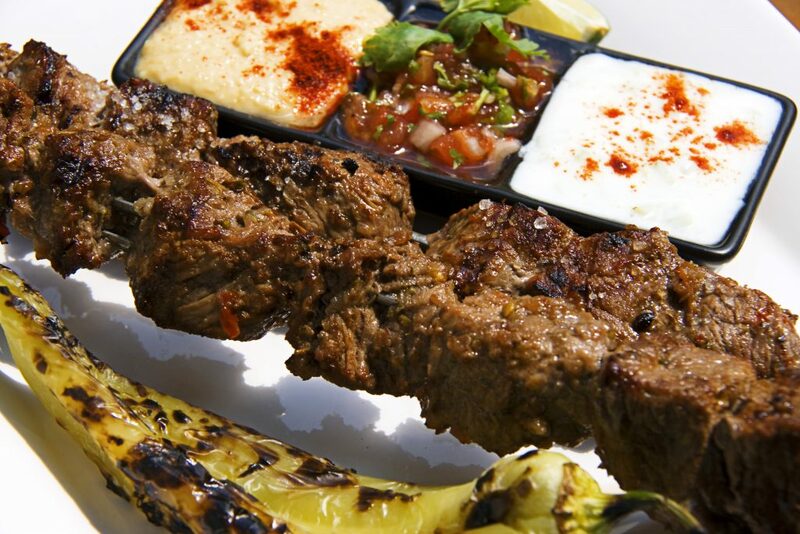 Kazandibi is the caramelized option you can go for too, which is also worth a taste. 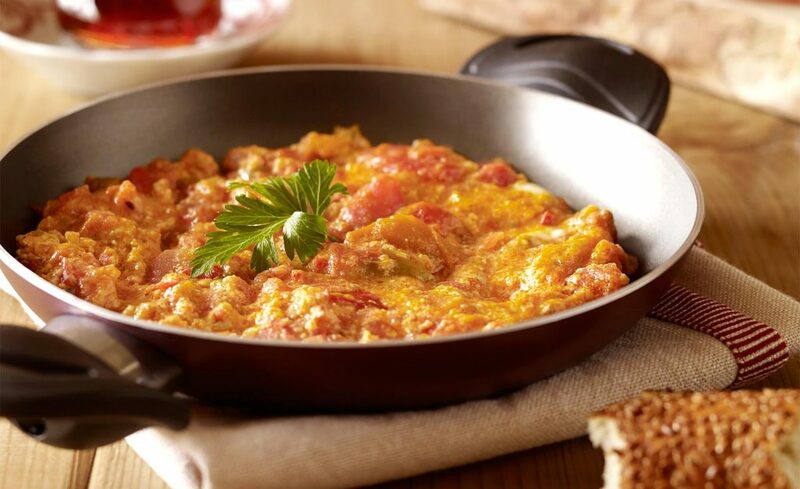 If you love eggs for breakfast, menemen is for you! It’s often compared to shakshuka. This dish is scrambled eggs in a tomato-based stew. Cheese and a spicy sausage called sucuk are usually added too. Take advantage of bread to sop up all of this gloriousness. Quite simply, this is lentil soup. 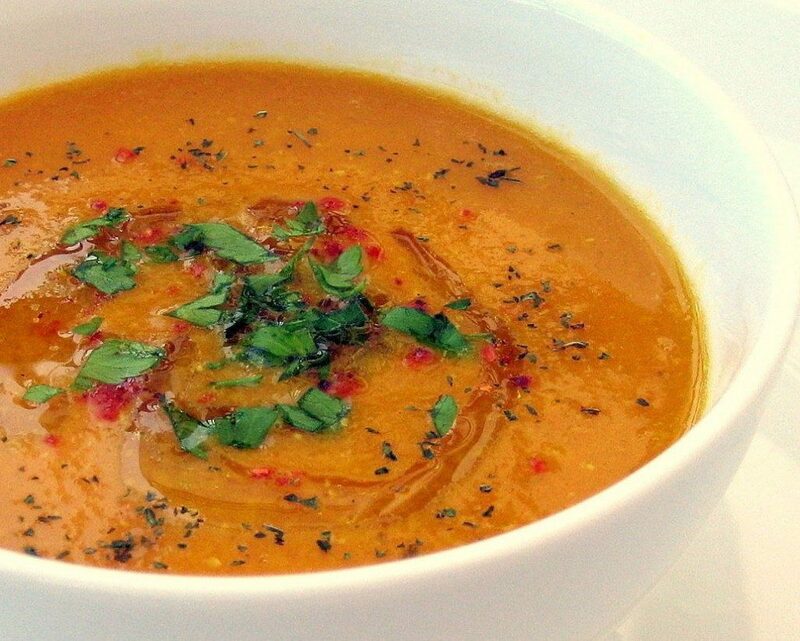 It’s made with pureed lentils and Turkish spices. Cilantro and fresh lemon juice always accompany it on the side. Sometimes you’ll see it with other garnishes like pickled vegetables. Pita bread also comes along, making for a soulful way to soak up this tasty soup. You’ll find it in every restaurant from casual to extravagant. Here’s another one that isn’t going to sound too appetizing, but trust us when we say you’ve got to sample this dish that is said to have originated from biblical times. Think of it as the most basic and original form of steak tartare. Fresh raw meat is mixed with spices, bulgur and scallions to form a ball of incredibly savory flavors. Enjoy it tucked into lettuce or on a piece of flatbread. It’s absolutely dreamy! 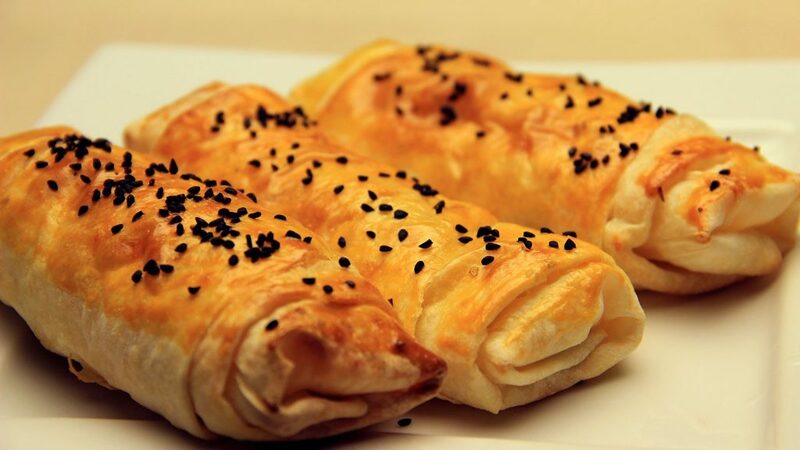 This pastry is beloved by all Turks. You’ll see it in individual portions as well as massive sheets that get chunked up to order by hungry customers. They come in a ton of varieties from savory with meats, cheeses, or spinach, to sweet. Sweet versions are usually dusted with powdered sugar and are acceptable as breakfast or even a quick snack in the afternoon. Now, on to the super-sweet. 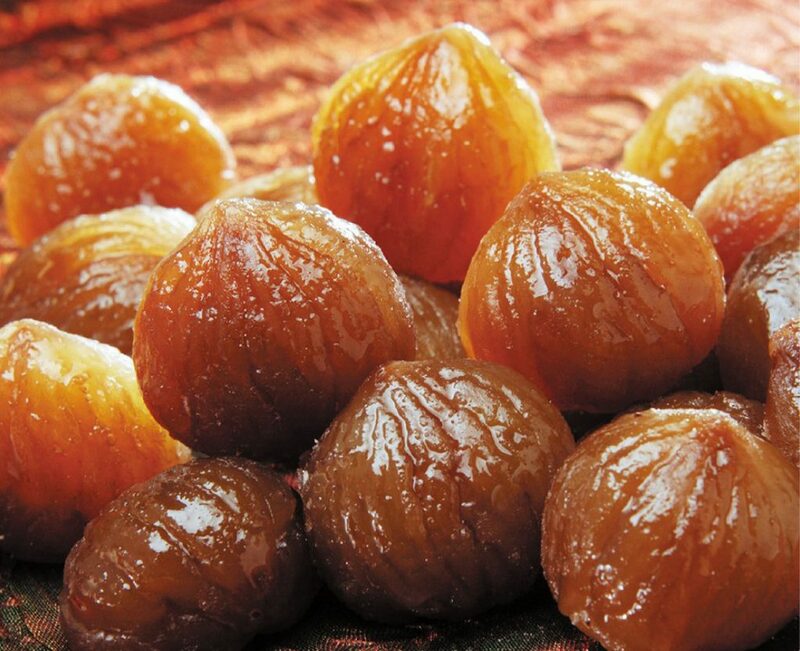 The people of Turkey adore desserts and this dessert of sugared chestnuts is no exception. 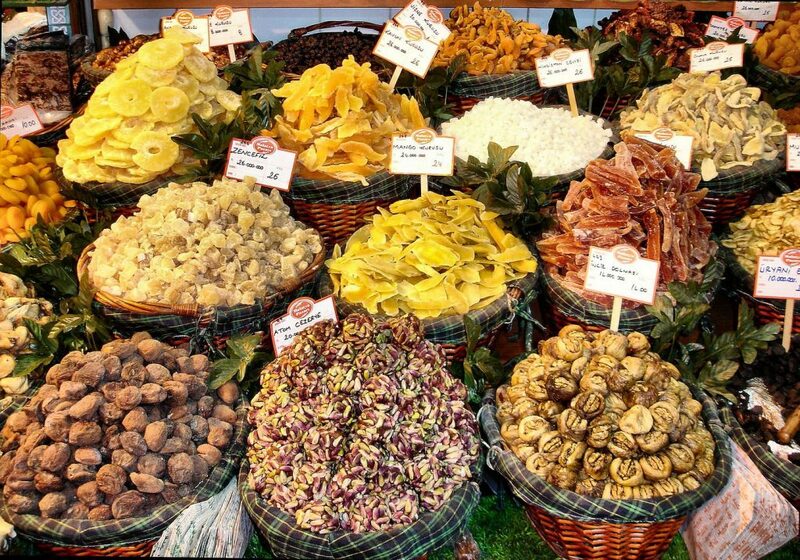 You’ll also find candied vegetables, fruits, and other nuts. Give them a try and you’ll feel ashamed you let yourself miss out on these blissful items all these years! 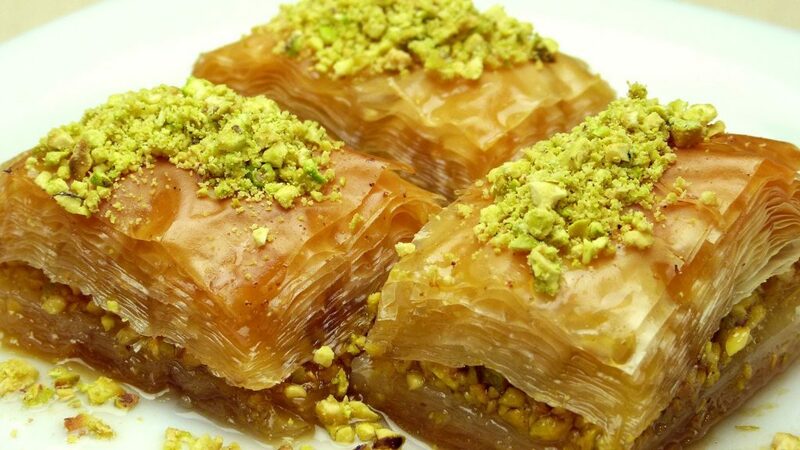 Perhaps the dessert that most people are familiar with from Turkey is baklava. However, it originally comes from Central Asia. If you’ve never sampled one of these sweet and tasty filo pastry stacks that are saturated with honey and heaped with pistachios, now is your chance to become completely hooked on it. For the health-conscious, there’s good news. A visit to Turkey doesn’t mean you’ll be surrounded by just desserts. You’ll find that Turkey has some of the best fruits and nuts in the world. It ranks in the top 5 for producing hazelnuts, cherries, figs, strawberries, peaches, walnuts, and a royal ton of other items. The Turks prize these things so make sure you enjoy the fruits of their labor, pardon the pun. Lokum is what the Turks have named these jelly cubes. 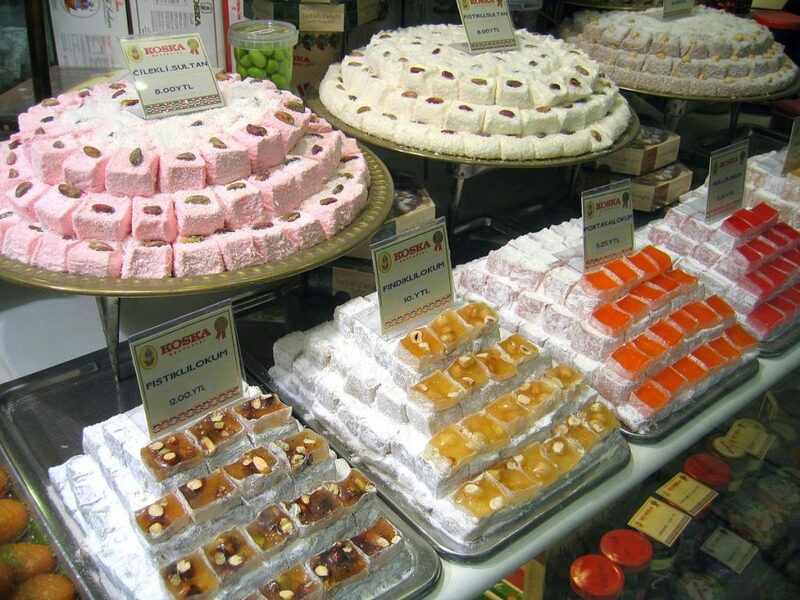 It comes from an Arabic word that means “morsels.” There is an endless array of Turkish delight that come in more shapes, colors and flavors than you ever could imagine. They are dusted with an icing sugar or coconut. You’ll also find them served with Turkish coffee at the end of your meal. And speaking of Turkish coffee, don’t forget to enjoy plenty of it. Most people think it’s a flavor but the name refers to the method in creating it. It’s all in the hands of the barista to ensure the coffee turns out with the perfect amount of foam on top. And while Turkish delights are indeed some of the best delights in Turkey, you could quite easily say the same of anything on this list. Turkey offers you a splendid chance to taste things that are much different than what you’re used to eating without being so completely strange they’re off-putting. Even the chicken pudding! 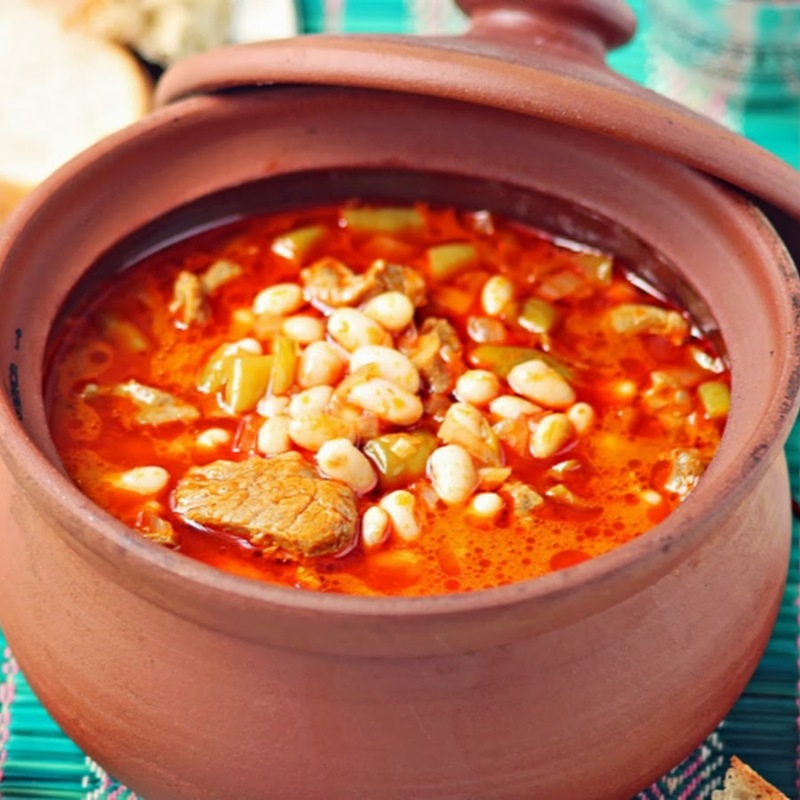 Enjoy your trip to Turkey and tell us what your favorite Turkish food is!